Z-PRIME Plus is a single-component priming agent designed to enhance adhesion between indirect restorative materials and resin cements. It is used as a surface treatment for zirconia, alumina, metal/alloy, composite, endodontic posts, and intraoral repairs. Z-PRIME Plus is available in a 4 ml bottle with a technique card and instructions. It is compatible with light-cured and dual-cured resin luting cements. It has single-bottle delivery for ease of dispensing, and requires only air dry for ease of application. Z-PRIME Plus was evaluated by 29 consultants in 510 uses. It received a 91% clinical rating. Z-PRIME Plus is easy to use by simply applying it to the internal surface of a clean, dry restoration before loading the cement. Consultants liked the single bottle with no mixing and appreciated that no refrigeration was required. Compatibility with dual-cured resins was a positive feature. Like most priming agents, the solution has a strong odor. 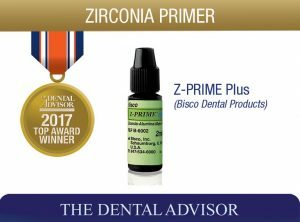 Forty percent of consultants reported that Z-PRIME Plus was better than their current primer and 50% reported that it was equivalent. Seventy-nine percent would switch to Z-PRIME Plus and 90% would recommend it. Z-PRIME Plus is a light-sensitive material. Once dispensed, use it immediately or protect from ambient light. Don’t apply too much. Use warm air to dry. Cannot be used for silica-based restorations (traditional porcelain).